The new Fujifilm X-T3 equips a 26MP X-Trans CMOS 4 sensor with more than 4 times the number of phase detection pixels than last generation digital cameras. The camera is powered by the X-Processor 4 image processing engine with up to 3x faster processing and is also the world’s first to delivers 4K/60P 10bit output. Fujifilm has introduced the X-T3mirrorless digital camera in India - the first of its kind APS-C mirrorless camera capable of 4K/60P 10 bit recording. The latest model features the new X-Trans CMOS 4 sensor and X-Processor 4 image processing engine and is available for a body-only price of Rs 1,17,999. The new Fujifilm X-T3 equips a 26MP X-Trans CMOS 4 sensor with more than 4 times the number of phase detection pixels than last generation digital cameras. It boasts a high S/N ratio and the lowest sensitivity of ISO 160 despite its 26MP resolution. The low-light autofocus limit has also been extended to -3EV, enabling accurate AF even in low light conditions, e.g. scene lit only with candlelight. The camera is powered by the X-Processor 4 image processing engine that can achieve up to 3 times faster processing and is also the world’s first to delivers 4K/60P 10bit output. In addition to the performance improvement, the image processor will be able to handle several functions like Color Chrome Effect and Monochrome Adjustment in an instant in a mirrorless form factor. The 26.1MP resolution is also the largest on an APS-C sense allowing lower noise levels due to more pixels. In terms of autofocus, the processor can now deliver 1.5 faster and accurate AF with face/eye detection with the help of the 2.16M phase detection pixels. The X-T3 can offer blackout-free continuous shooting at 30fps while supporting 4K/60P 4:2:0 10bit through internal storage and 4K/60P 4:2:2 10bit on HDMI output. The X-T3 features a 3.69-million-dot high-resolution EVF with a high magnification ratio of 0.75x. The display time lag of just 0.005 seconds and refresh rate of approx. 100 fps. The new “Sports finder mode” makes it easy to capture a moving subject. The mode shows approx. 16.6M (1.25x crop) area marking in the LCD/viewfinder, and shoots the area within the marking. 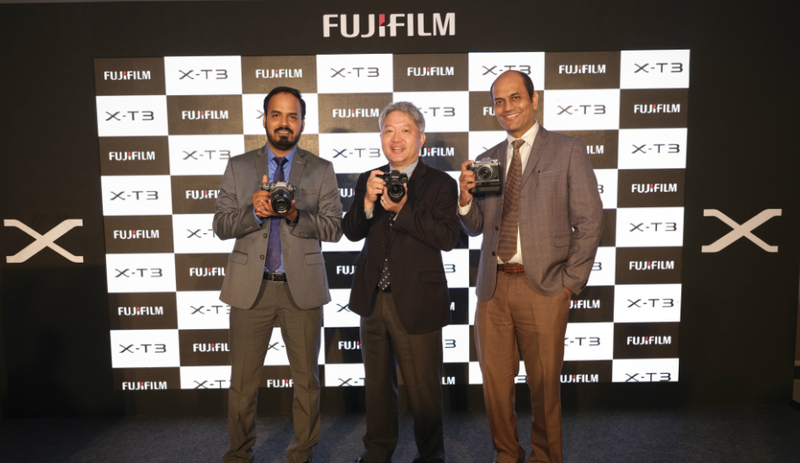 Speaking about the launch, Fujifilm India MD, Haruto Iwata said “It is a proud moment for us to announce the much-awaited Fujifilm X-T3 mirrorless digital camera in the same year which marks our 10th anniversary in India. As we celebrate this success today, we are also gearing up for the next big leap towards new goals, one of which is to achieve 30% Market Share in the Indian Mirrorless Market in the next 3-4 Years. X-T3 is our step towards that endeavour and we at Fujifilm are confident that the new X-T3 will receive the same recognition and acceptance received by its predecessors”. The Fujifilm X-T3 mirrorless digital camera will retail body-only for an asking price of Rs 1,17,999 and the same bundled with an 18-55 mm lens will retail for Rs 1,49,999.